This luxurious essential oil cream will melt into your skin and relieve those heavy muscle aches. 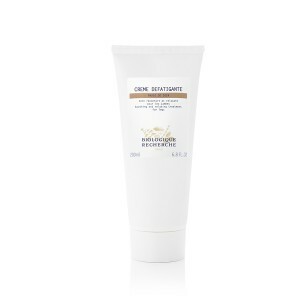 Crème Défatigante is an energising treatment that prevents and alleviates tired legs, leaving you feel instantly fresh, light and comfortable. With lemon and mint essential oils to refresh, arnica to provide and anti-inflammatory response and thyme and cypress to tone the skin, this cream will ease blood circulation. It can be used on any areas of tension and particularly efficient for sports fanatics or people practising physical activity to reduce muscular tiredness. Ideal for athletes, people working on their feet and before/after physical activity. Refreshing and anti-inflammatory agents: Peppermint Essential Oil, Lemon Essential Oil, Thyme Essential Oil, Cypress Essential Oil, Arnica Extract. Decongesting agents: Fucus Extract, Ivy Extract, Birch Bark Extract. Dermis firming agent: Complex of Elderflower, Chestnut tree and Myrobalan Leaf Extracts. Microcirculation activation agent: Complex of Arnica Flowers, Solomon’s Seal and Cypress Cones.